Manufactured by the J. C. Deagan Company during the brief timespan of 1938–42, the Model 30 Vibraharp was designed as a lightweight, portable instrument. 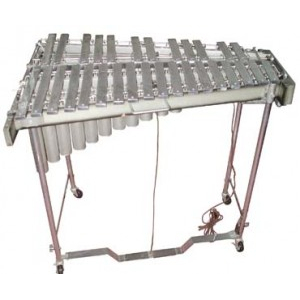 From the inception of both Deagan’s vibraharp and Leedy’s comparable instrument, the vibraphone, the standard range had been three octaves, F to F, with high-grade steel keys. In order to reduce the weight of the instrument, Deagan eliminated the lowest (and largest) keys, which resulted in a 2 1/2-octave, C to F range. 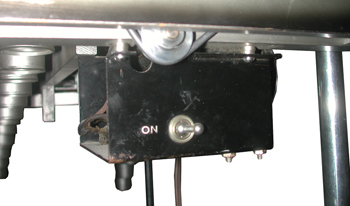 A second change was to reduce the stand to a simple, straight-legged support system with a thin pedal mechanism, both of which had less mass when compared to prior vibraharp designs. 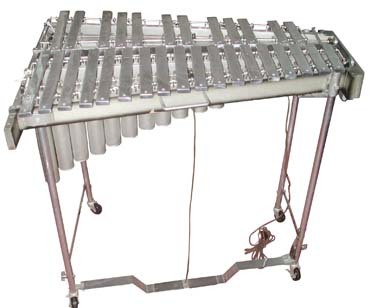 A third change was to utilize cardboard, instead of brass, as the material for the resonatorsThe metal pipes that extend below the bars on a marimba, xylophone, or vibraphone. They carry t.... The cardboard resonators were capped on the end with metal and suspended in a box frame to provide adequate support. The motor, used to rotate the fans with a simple pulley system, had only one speed, and it was actuated with a simple “on/off” toggle switch. For ease of transport, the legs and pedal can be quickly disassembled and the entire instrument placed into a single canvas bag. A prominent handle, used for carrying the lightweight instrument, extends from the two-tone, duco-finished frame, which measures 32 inches in height, 37 inches in length, and 26 1/4 inches in width. The keys, all a half inch in depth and 1 1/8 inches in width, range in length from 6 to 12 1/2 inches. 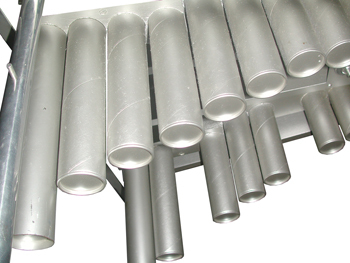 The resonators, all 1 3/4 inches in diameter, range in length from 1 1/2 to 12 inches. When first introduced in 1938, the instrument sold for $195.00, and when it was discontinued in 1943, it listed for $260.00.